Are you looking for web portal development services? You have indeed dropped at the right page for assistance. In this write-up we have given all the details related to web portal development. Go through the article and gain some knowledge about the utility and variations of web portal. We assure you that you will get clarity regarding web portal website. If you are willing to know more regarding web portal development, reach our experts for assistance. Web portal lets users to gather information to meet their needs and requirements. It allows every organization to increase their involvement with the customers, employees and business partners by letting the engaged communities to access new information. Vertical: The main concern of this portal is construction. It mainly focuses on construction industries. Horizontal portals: These portals have some benefits for everyone and are appealing to a wide range of interests. Some of the examples would be Aol, Yahoo UK, etc., that gives users a reliable gateway to operate popular email, news and other relevant information. Employee: Employee portals provide employees with important information related to work schedule, forms and notices for upcoming programs. Customer: This website imparts relevant information such as tracking numbers and past purchases. This website is particularly used on e-commerce website. Partner: Partner portals facilitate the line of communication between the companies that are associated with it. Community: These portals primarily contain bulletin board information. With upcoming frameworks, effective development tools and evolving technologies, this year looks extremely promising for web developers. Most developers and technical leads confront specific demands every time a new project lands on their lap. Earlier, it was all about having a website and HTML was the essential language used for building websites. However, the internet market has changed from simple static web-based HTML locales to sophisticated dynamic websites developed on various platforms. Sun Microsystems developing JAVA is a standout amongst the most mainstream programming languages on the internet. Java is an independent programming language that supports numerous operating systems in additional types of hardware too. PHP is used to imply the PHP Hypertext Processor language and it is an interpreted script language. The world’s most prominent content management systems including – WordPress, Joomla and Drupal are written in PHP. Python is one of the facile languages to learn. In the meantime, it’s equally intense and very adaptable. Python is also the favorite language for hackers to do quick scripting and develop hacking software. Ever heard of any other service provider that offers you with so many facilities? We have gained immense popularity over the years as a service provider. We have never offended our customers by failing to live up to their expectations. The best tech-savvies work with us and they are given proper training so that they can cater to all your needs related to web portal development. 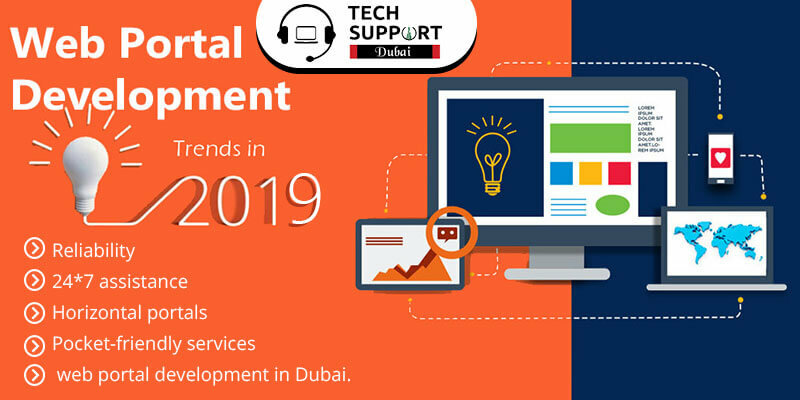 Talking to our experts at Tech Support Dubai will give you clarity regarding the reasons that make us the best in Dubai. What are you waiting for when the best in class service providers have come to your rescue? Without wasting your time, call us at our number: 042053349 for web portal development in Dubai. Bothered about service charges? Don’t entertain such worries as we offer our services at a reasonable rate. Besides everything else, we are known for our genuine and authentic services. As a matter of fact, we have pledged not to fool our customers by over-charging them. Reach us immediately for amazing services. Your feedback regarding the quality of our work will be appreciated. Web Portal Development Company in Dubai is just a call away! We also provide B2B web development service in Dubai.